In this article we are going to cover Pages per object in buffer pool. 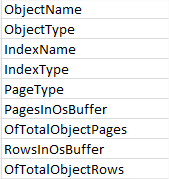 Find pages per object in buffer pool. This Transact-SQL script lists buffer statistics for all Tables in the database. Hope you will like to Pages per object in buffer pool.